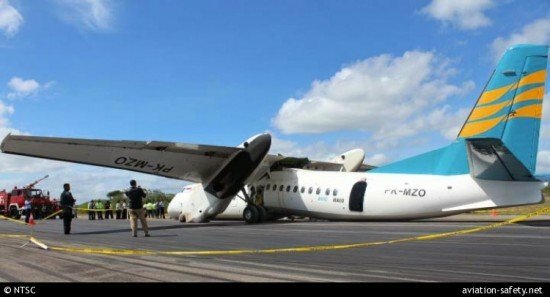 The Indonesian National Transportation Safety Committee (NTSC) published the final report of their investigation into a hard landing accident involving a Xian MA-60 at Kupang, Indonesia. The first officer had moved the power levers in Beta Mode while on final approach. The Xian MA-60 operated on a scheduled domestic passenger flight from Bajawa Airport (BJW) to Kupang (KOE). There were 46 passengers and four crew members on board. The flight from the departure until commencing for approach was uneventful. The weather at Kupang was fine and a visual approach was flown to runway 07. During the approach, the power lever lock was selected to open position in accordance with the operator’s normal checklist. and remained in that position. The autopilot was disconnected while descending trough 1100 feet. At that point the airplane was just above the 2.9° approach angle. The first officer, who had 117 hours on the MA-60, had the habit of delaying the movement of the power levers to the Ground Idle position during landing. He then possibly tried to prove that he had overcome the error by operating the power lever stop slot during approach and unintentionally moved the power lever beyond flight idle. The left power lever was moved in the range of Beta Mode while the aircraft altitude was approximately 112 ft and followed by the right power lever at 90 ft. The airplane lost altitude quickly and touched down at a vertical acceleration on impact of 5.99 G. The wing separated from the fuselage and both underwing engines tilted forward, contacting the runway surface. The airplane came to rest after sliding 200 m down the runway. There was no fire. Five occupants sustained serious injuries. – The procedure of selecting Power Lever Lock to “OPEN” during approach was made without comprehensive risk assessment. – Both power levers entered BETA MODE at 90 feet due to the safety device namely Power Lever Lock has been opened during approach, which was in accordance to the operator procedure and lifting of Mechanical Power Lever Stop Slot which was not realized by the pilots. – The movement of power levers to BETA MODE resulted the pitch angle changed to low pitch angle which produced significant drag and made the aircraft loss of significant lift.